The Horiba SLFA-60 Sulfur-in-Oil Analyser is the new standard of transportable sulfur-in-oil analysers. The instrument is equipped with the latest software and hardware, reflecting the growing changes in the petroleum industry. Data from the expanded storage of calibration curves can be exported using the USB output. The SLFA-60 Sulfur-in-Oil Analyser benefits from the increased measurement range of 0-9.9999 wt% covers high sulfur crudes and shale oil markets. The printout can be easily comprehended as it is available in an 80 mm wide format. The SLFA-60 Sulfur-in-Oil Analyser's protective membrane covers the cell window which prevents the detector and X-ray tube from inadvertent sample leakage. This protective membrane is able to be assembled and replaced easily. Real-time data is displayed on the screen, allowing the user to check the measurement conditions. 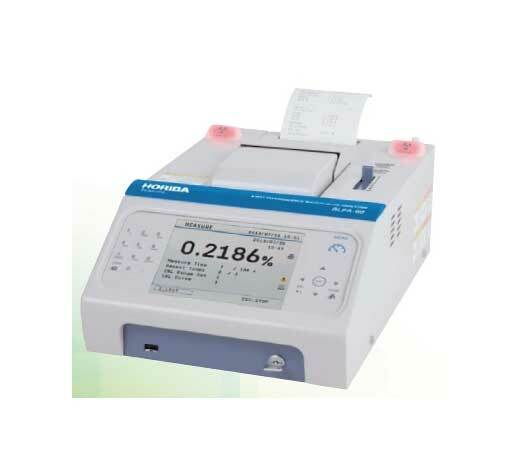 The SLFA-60 Sulfur-in-Oil Analyser's measurements can be recorded using three different methods; by printouts, exported to a USB device or exported to an external PC through the USB connection. This features enables the user to track and analyse measurements throughout the SLFA-60 Sulfur-in-Oil Analyser's lifetime. Spectrum measurement - Energy Axis: 0 - 10 keV, spectrum analysis to verify instrument performances.